Don’t buy a new TV! You probably never thought you would hear hear that from an A/V company, but for some of our Dallas clients we now have a better option. If you are looking to mount a TV over your fireplace, or inside an existing cabinet then a traditional TV such as a Sony Z9D or Samsung Frame is still the best answer. But if you are after a theater-like experience without the giant projector hanging off the ceiling we have a great solution for you. For the client that desires a great entertaining space with maximum aesthetic appeal, the best new “TV” isn’t a TV at all, it is an ultra-short throw (UST) projector. A UST sits inside furniture placed directly under the projection surface, in this case the wall or screen on which you want to view the image. Particularly in modern homes, this is a game changer. 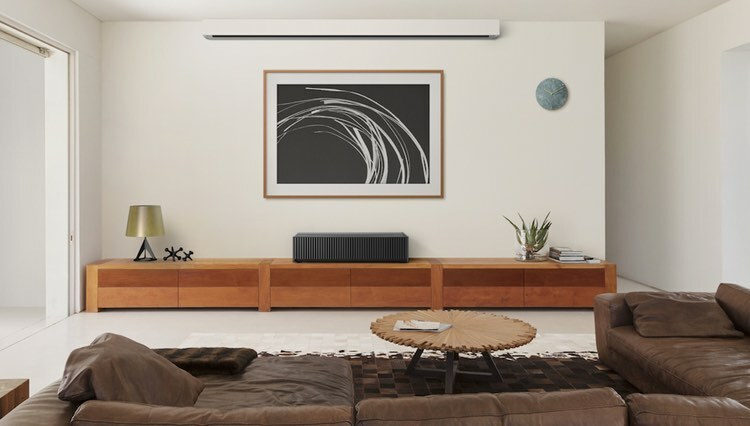 While the Samsung Frame does a wonderful job of getting rid of the black hole created by a TV that isn’t in use, an ultra-short throw projector aimed it a white wall simply vanishes when off. If seeking even better performance a screen designed for a short throw projector can be motorized into the ceiling as if it were never there! So what does a ultra-short throw projector do best? The single biggest strength is the size of the image it can display. Sony’s phenomenal VPL-VZ1000ES can display a 120” image when placed just a hair over 8” away from the wall. The Epson LS100, utilizing a laser in place of a standard bulb, can display a 100” image placed 10” from the wall. The largest standard TV we offer is the 100” Sony Z9D, which costs nearly $60,000, 20x more than the Epson at only $3,000! A significant strength of the UST compared to a traditional projection system is the ease of installation. A UST projector sits in a piece of furniture under the “TV wall” just like your cable box. It is easier to install a UST projector than to hang a large TV on the wall, which is pretty crazy. Where an ultra-short throw projector really shines is bringing the theater-experience into rooms that would typically not benefit from such an enthralling presentation. If you are like the majority of homeowners who do not have a dedicated theater space you can use the UST projector to give you the theater experience in any room. Compared to a TV the UST projector has just a few downsides. As bright as they are, a traditional LED TV will get brighter. Most people run their TVs much brighter than is ideal, but if we are looking for downsides, that is one of them. Regarding the installation, most people won’t want the projector sitting on top of a piece of furniture, so consideration will need to be given to hiding the projector. Our favorite option is the Salamander UST Cabinet. These A/V cabinets can be customized to fit just about any decor, while providing a place to conceal the projector, equipment and even speakers for a very custom look. To get the best, most TV-like performance out of a UST projector a screen designed for use with a UST projector is recommended. These screens are designed to reject the light cast by ceiling mounted lights, keeping them from washing out the image. This is somewhat similar to an anti-glare coating on a TV, as both are designed to improve your view of the TV in adverse lighting situations. These ambient light rejecting (ALR) screens are available in fixed and motorized versions. With a motorized screen you can still have the completely uncluttered wall when not in use, but with a single button press the projector can turn on and the screen can drop from the ceiling. If you think the ultra-short projector may be a good fit for your personal home, or for your next Dallas area project, contact us today to learn more. We are happy to take a look at your home, your plans, or just to talk over your options to help find the best solution for your specific needs.